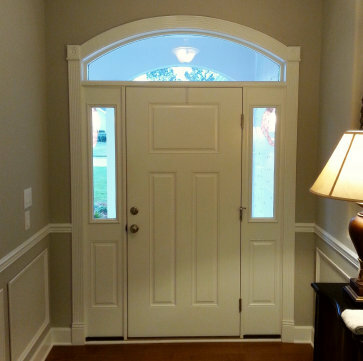 The Kelsey's called to discuss adding beveled sidelights and a beveled transom to a new home they had just built in Gulf Shores, Alabama. We looked at a number of options and finally decided on 2 different glue chip bevel sets that would work perfectly with their existing transom and sidelight glass. 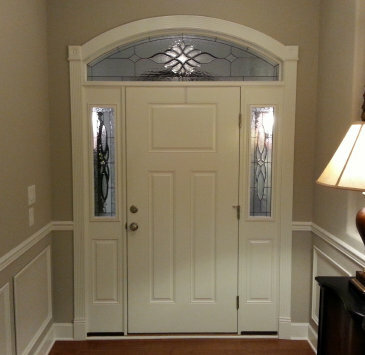 The sidelight bevel set is pictured to the right and the transom set is pictured below. The goal was to build the glass so that it would fit perfectly inside the existing glass and be secured with matching molding. In this way the tempered exterior glass, already in place, would protect the beveled glass pieces from breakage or the elements. We used a band of clear glue chip glass around the borders of each piece to highlight the glue chip in the bevels. Two star bevels were added in the transom to balance the central bevel set. Glue chip glass is a texture that looks like frost or a fern like pattern on glass. This pattern is created by applying hot animal glue to the sandblasted surface of clear glass. As the glue dries, and contracts, it pulls flakes of glass off the surface in a random fashion. Glue chip glass is very popular for backgrounds in windows and cabinets and is especially beautiful combined with bevels and bevel clusters. 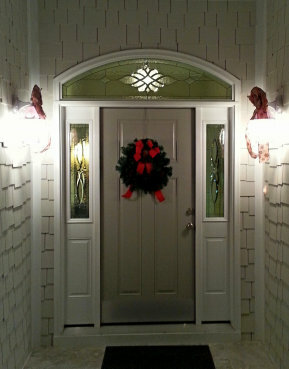 The Kelsey sidelights measure 7.5" x 35.5" and each contain 29 pieces of glass. The transom measures 16" x 62" and contains 39 pieces of glass. They were completed in December, 2015.